Irish Stew, or 'stobhach Gaelach' in Irish Gaelic, is a traditional hotpot quite popular in Ireland. This lamb stew is made with potatoes, onions and carrots. It is usually accompanied with a brown stout sauce. Simple and packed with flavours, this dish is traditionally served in Irish pubs with a slice of brown bread and a pint of Irish stout. This recipe has been carefully prepapred with beef and lamb meat, potatoes, onions and carrots cooked until tender and soft. 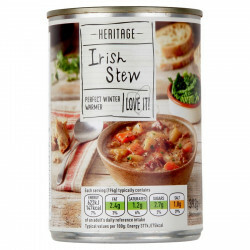 An incredibly conforting, delicious hot Irish dish! The British brand Nisa Retail Heritage develops a range of delicious products for everyday baking and cooking. Focusing on quality and taste, Nisa Heritage easily brings to you British specialties, such as kitchen products and hot dishes! Ingredients : water, vegetables (32%) (carrot, potato, dried onion), beef (10%), mutton (10%), fortified wheat flour [wheat flour, calcium carbonate, iron, niacin (B3), thiamin (B1)], pearl barley, modified maize starch, salt, vegetable bouillon [vegetables powder (carrot, mushroom, onion), flavouring, yeast extract, tomato powder], white pepper. For allergens : contain cereals containing gluten, see ingredients in bold. Keep in a cool dry place. Although every care has been taken, this product may contain bones. Once opened, store the remaining content in a airtight container, refrigerate and consume within 2 days. Best before : see can. Instructions : may vary depending on appliances, these instructions are given as guidline only. Adjuste cooking time according to your microwave. Hob - 4.5 to 5 mins. Empty the content in a saucepan and heat gently, stiring once in a while until it's hot (do not bring to boil). Microwaves (800W) - 3.5 to 4 mins : empty the content of the can in a microwavable container. Cover allowing air to escape. Heat on full power during 3.5 to 4 minutes, stir at halftime cooking and before serving.